If you’re aware of what’s going on in the tablet market, you will know that the brand new 10.5 inch iPad Pro is the apple of the eye of every Apple lover and you would be rather surprised to know that this tablet is even outshining it’s larger contemporary. The iPad Pro 12.9 is definitely an upgraded version of its predecessors but the 10.5 model is being acknowledged by everyone for being just about the right one for productivity, creativity and also portability. However, you have to realize that the iPad Pro along can’t enhance your productivity of whatever you do. The iPad Pro 10.5 will need a few friends by its side in order to offer the best possible user experience. Here are few must-have accessories that you can buy if you’ve already bought an iPad Pro 10.5. Also read on to know why you would need them. They say that the stylus called Apple Pencil was designed for the iPad Pro and vice versa. 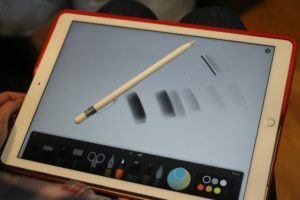 Although there are several reasons to purchase an iPad Pro without buying the stylus but the cheaper and newest version, the 2017 iPad may just as well shell off few more dollars from your pocket. The ‘Pro’ added to the iPad is all about using the Apple Pencil. The Pencil is used for more than making art and poking on apps. With the iOS 11 version of Notes, you won’t ever have to think of not having a pen and paper in your hand if you want to write down something that’s urgent. As long as iPads have come into the market, keyboards for iPads have existed since then but all these keyboards share one of the most common feature without which it can’t be connected and that is Bluetooth connection. Although you may think of using some other bluetooth keyboard by connecting it through BT but that would mean the addition of yet another device, whose battery you need to be concerned about. On the other hand, the iPad Pro has Smart Connectrs and this is why it is given the name of Smart Keyboard. They are lightweight, slim and though this keyboard might not be rock solid but it can definitely get your job done. One of the biggest issues of the Apple Pencil is that Apple doesn’t offer a way for the users to keep the stylus safe when the user is not using it. Whenever the company doesn’t provide ways of keeping the stylus safe, there are several other companies who will pop in. Belkin’s Case and stand makes its own case for the Apple Pencil and it even has a stand to keep it within a short reach even though when you’re not using the Apple Pencil. The only time when your smart keyboard is actually not so smart about is safeguarding the back portion of your iPad Pro. In case you’re trying to cover up something which looks of premium quality, you might just as well cover it with anything that is not of good quality. This is when you need Pen & Quill which is one of the most popular accessory makers whose brand has latterly become famous for stylish quality. This case can give the look of a premium paper notebook. Therefore, if you’re a gadget-freak and you love to handle many gadgets at a time, you should benefit from the above mentioned data on the best accessories you should carry with an iPad Pro 10.5 screen size.